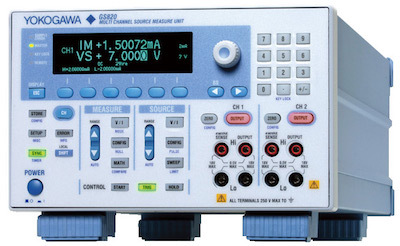 The GS820 can measure the power conversion efficiency of a three-terminal regulator or a DC-DC converter. A channel for supplying power is connected to the primary circuit and another channel for consuming power is connected to the secondary circuit. 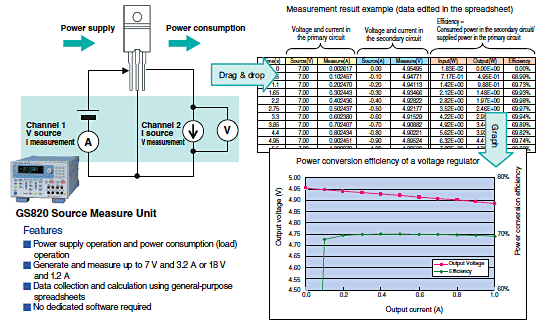 Then, the load current is swept to vary the consumed power and supplied power. The power conversion effi ciency is determined from the ratio of the consumed power to the supplied power.